Want to try CBD but not a fan of the flavor? We got ya covered! Each caramel candy has 20 mg of CBD. Each 3.4 oz package comes with 12 caramels; containing a total of 240mg of CBD. It is best eaten slowly, to savor the taste and absorb the benefits of our full-spectrum hemp CBDs. 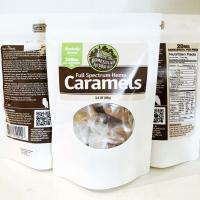 The hemp CBD used in the caramels is full spectrum, CO-2 extracted, grown and processed here in Kentucky. Hemp CBD has been shown to be anti-inflammatory and neuroprotective. There is some evidence that hemp CBD is an anti-carcinogen. To ensure every batch is right, we contract with a third party lab which specializes in hemp testing and is ISO 17025 accredited, to test every batch of CBDs we put on the market. *** All CBD Products are grown in the Kentucky Department of Agriculture's Hemp Program and contain less than .03% THC. ***These statements and products have not been evaluated or tested by the FDA and are not intended to diagnose, treat or cure any disease.